Whether you are conducting a phase 3 clinical trial of a new therapy or looking for biomarkers, you will need to collect samples, and that leads to a number of questions. How do you collect the samples in such a way as to preserve their usefulness—maintain molecular integrity— for your specific (or unknown) downstream analyses and assays? How many samples will be needed, how many “collectors” will be involved, and how many locations? How long do the samples have to be preserved, and how will they be stored? And how will you manage the data? The simplest collection kit, when labeled with a QR code and combined with mobile technology, can serve as the starting point for data collection as well as specimen collection. The participant ID, consent, biospecimen, assay results, and questionnaire responses can be linked via the QR code and immediately uploaded to the cloud. The savings in data management made possible by this emerging technology could dramatically reduce the cost of cohort studies that are the foundation of biomarker research. 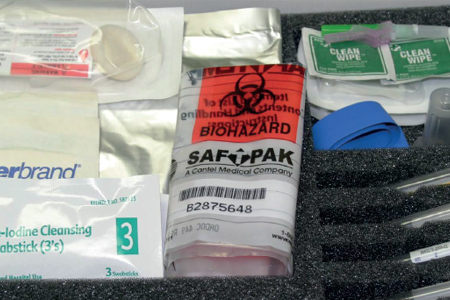 Another advantage to the use of kits: when combined with mobile technology, a well-designed kit provides structure for clinical staff in their time with study participants. The kit and software for the mobile device can help clinical staff walk participants stepby-step through consent, completing a questionnaire, drawing blood, and so on.